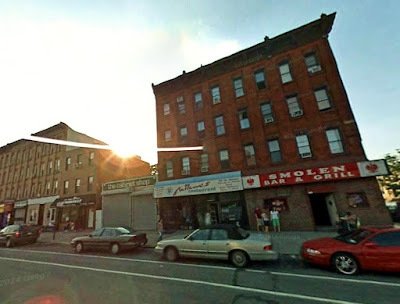 It's too bad Google will only take you back nine years, but these days even a view from 2007 will reveal a quite different array of bars, restaurants & grocery stores. The woozy grain & wildly distorted perspective of the Google streets can lend a dreamlike quality to even the recent past. Here's Smolen then, when the Polish eagle still perched at vantage points about the neighborhood. Here's Mary's this week, after its brief run. The bar was being dismantled yesterday, and a guy inside told me Mary's lost its lease. Apparently the place is up for rent again. Today, some farewell sentiments up top. In 1896 James Bowdell owned a liquor store here, & in 1899 the Eagle identifies Fogarty's saloon at this address. In the 1920s and 30s Grafanola's radio & music store is advertised at 708 & it's listed as being in the Prospect Section of Brooklyn. So there's another name to add to the list. A wasted billboard opportunity. A couple of crusties with requisite pitbulls were trying (unsuccessfully) to hitch a ride on Prospect as I passed by. Last August the Real Deal reported that the Daten Group were in contract to buy a group of adjacent properties at Fourth & Prospect from the Rabsky Group. Rabsky purchased the properties earlier in the year for $15.4 million, & was set to flip them for $24 million. With Daten's purchase, plans for development were to switch from rental to condo, with architects Kutnicki Bernstein to replace Karl Fischer. According to The Real Deal, Daten planned to begin demolition "in the next two months." 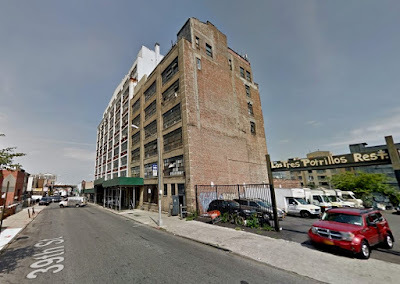 Summer, fall & winter passed, and the properties at 575-81 Fourth & 189-195 Prospect, purchased by Daten with demolition already approved, are still standing. Construction plans filed by Rabsky were never approved, and no new plans have been been filed by Daten. A release of mortgage filed last month may bring some action. So many of our city landscapes seem to exist in limbo. The leveled lots, the closed stores, the vacant houses, doors ajar, posted with rodent bait & demolition signs. Buildings half-demolished, or buildings half-complete, frozen by Stop Work Orders. They're at every turn. 7:00 p.m. A fire that broke out this evening at 561 Fifth Avenue (home to La Nacional & next door to recently relocated bar Excelsior) appears to be under control. When I arrived, at a little after six, firemen were working at extinguishing fire in the roof of 561. 561, 563, & 563A (Shirly Nails) share the same structure, so clearly the other two businesses will be also affected, particularly Excelsior. The businesses on the other side of 561, Rawaj Eyebrow Threading Spa & Jake's Handcrafted, are in a separate building & did not look to be as seriously impacted. By the time I left smoke was no longer apparent from outside, but fireman were still on the roof. There appeared to be no injuries. 5/29 An update today from Park Slope Stoop. La Nacional was shuttered when I walked by this evening while Rawaj & Excelsior were back open. I'm sad to report that the Breadfruit Tree Cafe at Fourth & 10th is definitely closing. The owners were clearing out the cafe space today & said they were planning to relocate the business to Crown Heights. Also gone is Roosters (Fifth & 19th), where there's a For Sale sign on the shutters. Both places, opened in mid & late 2014, appear to have had their ups & downs, with periods of closure & changes of management. I'm sorry to see them go - I enjoyed their food. The mystery of Marleey's (What are its actual business hours? Is it still open?) continues, so it's looks like it's just the food truck for Caribbean food round here*. Next door to Roosters, workers are still busy at the Hudwelker condo conversion site. Today I was sad to see the remains of that mysterious Factory/-actory/-actor/-acto sign gone. I have better pictures of it somewhere or other, but the best I can come up with is here, where it basks in the wintry rays of a February sunset. On the same block, there's Purple Rain on the shutters of long-closed & soon to be demolished Selina's bakery, at 645 Fifth. I'm not the first to have noticed this one. It's raining all over the city right now. * 4/29 Marleey's was open on Friday night - guess it's the daytime hours that fluctuate. There are still some chillier days left. Spring at Fourth & 16th. The Lucille Fornasieri-Gold photographs collection comprises 93 color and black-and white photographs taken by Gold between 1968 and 2008. Gold’s work is primarily street photography in nature, with many posed and unposed portraits of people throughout Brooklyn and Manhattan. This collection is fully digitized and can be viewed here. In time, we will make more of Gold’s photographs available online. What vintage? I love this very literal brawny-armed ad, but in our hotter years it may have acquired a somewhat less innocent subtext. Please Fifth Avenue & 9th Street, never get fancy. By the Deals & Discounts & NYC Falafel, we'll settle for ebrities, or even lebrits. It's far, far better that way. All's quiet at Fourth & 12th, where work on the Mercy sheltered housing has ground to a halt. Permits for work at the site have all expired, & this is what we saw through the fence yesterday. In some odd bureaucratic quirk, the DOB still lists this site as 215 12th Street (the next block down, below Fourth). It's a shame to see the luxury housing on Fourth sprouting up in abundance, while this little project, set to serve disabled youth, is still a big pile of dirt. Something's up. Has Smoky been found? You can't tell from the photo but this missing animal notice on 9th Street is the largest I've ever come across. There are others posted around Gowanus, but on this particular one Smoky has been given magnificent whiskers. Hope you're home by now. As houses go upwardly mobile their aluminum awnings are sure to hit the dumpster. So it's quite a surprise to see a new building (or enlargement, at least) going out of its way to get a new one. Has the day of awning chic finally arrived? We expect the Times to be onto the trend in oh, a year or two. A few store signs from this week's walking. Some better known than others, all of them staples of a New York landscape. Our city comfort food. The warehouses at 639 McDonald stand right across from the train tracks, just where the underground F trains make their break for daylight. I love these kinds of urban transitions. The earliest photograph I could find of 639 is dated 1929, and I'm guessing the building in the photograph is new. Today it's joined by an identical Deco twin, which must have appeared shortly after the picture was taken. By 1935 the buildings are mentioned in the press as the Thomas Brothers Fireproof Warehouses, and twenty years later public auctions of goods for which storage payments have lapsed are still being announced. It's unclear what businesses occupied 639 in subsequent years, but the sign on the store today is for Empire State Supply Co., which sells hardware & construction supplies. You'll have to cross the avenue to see the sign, and you're in for a treat. The Empire State Building (1931)! Matching the company name, of course, but also attached to a structure of just the same architectural vintage. That's style. 740 Fourth, a four-story, five-family mixed-use building at the NW corner of 24th, was sold in a bankruptcy auction ("tremendous upside potential") last December. A deed of sale dated February this year records a sale of $1,575,000. 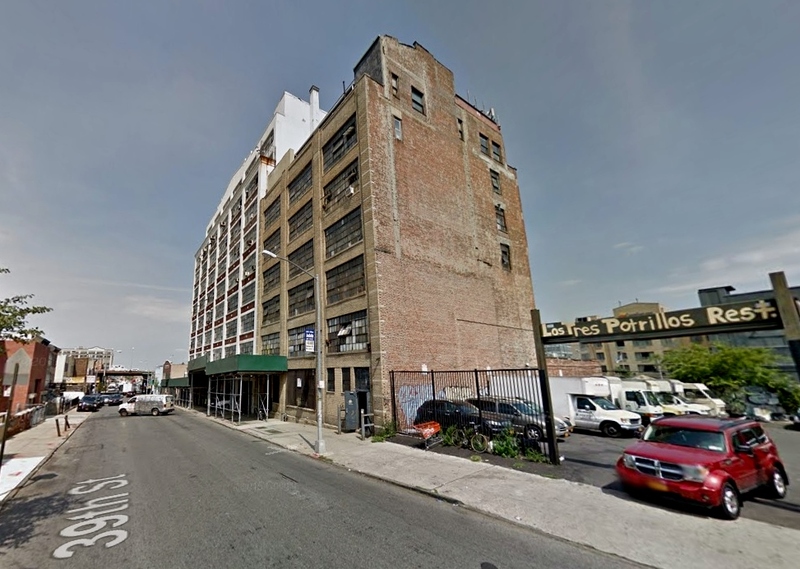 The buyer is 740 Fourth LLC, with a midtown Manhattan company address. At 488 (11th/12th), two up from Danny's Rim & Tire Shop, demolition of a three-story six-family building is underway. 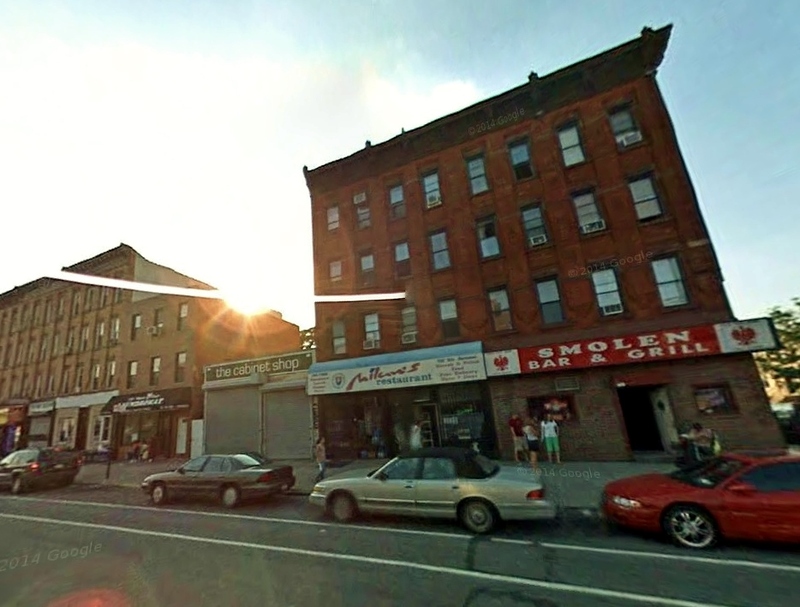 Righteous of Park Slope LLC's plans for a ten-story, ten unit-plus-store building are not yet approved. Tenth Avenue & 38th St.
Last time I walked along Second at 52nd, I noticed the signs on this (30's?) corner warehouse building, and wondered what their history was. Like esteemed NYC historian Kevin Walsh, who had, of course, documented his travels here, I thought they seemed a little too freshly painted to be genuine, & it was a Forgotten New York reader who solved the mystery. The corner appears in an episode of Boardwalk Empire, with signs added for period looks. 52-01 has been occupied most recently by a construction company. It was purchased by Hang Fai Realty LLC in 2014 for $1,800,000 & is currently listed by Brooklyn Real Property Inc for $4,890,000. FAR 2 with approved plan to built 7 stories + 2 floors basement parking lot (Approx 24 cars totals) & 1st, 2nd & 3rd floor community & restaurant. Floor 4,5,6 & 7th floor hotel (56 rooms) 14 rooms each floors! Roof top with NYC skyline view & Statue of liberty! After built approx 42,000.00 to 45,000.00 ft) Near train only 2 blocks away & 15 Minutes to Manhattan! Yes, another hotel. Demolition was approved last year, & it's only listed by Brooklyn Real Property as "land," so I figured the warehouse had already gone, but I headed down to look today & it's still there. Farther north, another "repurposing" is in the works. I'd noticed the sales listing earlier this year, & The Real Deal now reports that Madison Realty Capital are closing on a $37M purchase of two vacant warehouses on 39th Street, with a plan to use the space for offices. Earlier tenants were primarily garment industry businesses. The seller the Hampshire Companies out of New Jersey bought the buildings for $18.5 million in 2013 and then began buying out tenants to vacate the properties. Two more quick buy & flip business deals in a relentless waterfront market. "This building is not a 'short stay' hotel"
Fatal Hit-and-Run at Fourth & 22nd.